Access Publishing completed distribution of its local business directory this month to the 82,207 residents and businesses of Paso Robles, Atascadero, Templeton and surrounding areas. North County Access is a leading source of local business information to help consumers make buying decisions. 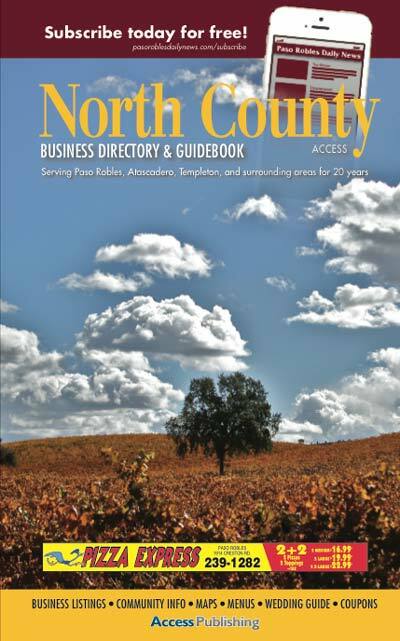 In addition to the print edition that is delivered every year, the website northcountyaccess.com gets thousands of hits every month and is a top internet directory for locals. This year marks the 21st anniversary of the first North County Access printed in 1993. “I would like to thank all the advertisers who made this year’s publication a success,” said Scott Brennan, CEO of Access Publishing. “It’s the directory locals have used to find goods and services for 20 years and running. I would also like to thank our printer, Casey Printing, and everyone on our hardworking team who helped with the project,” Brennan said. Advertisers get results. ” We get more results from Access than any other advertising we do,” said Toni Elhajnasr, owner of Pizza Express in Paso Robles. “I always get a lot of coupons back from the Access yellow pages,” she said. “If you’re in business around here, be sure to check out your free listing in the book and online at northcountyaccess.com,” Brennan says. Businesses can add new listings, photos and additional information for free. Residents who prefer online directories can opt-out of home delivery at yellowpagesoptout.com. Advertisers inside of North County Access include: A Mobile Notary by Sally, Auto Limits Auto Repair, BK Pool and Spa Service, Cal State Auto & Truck Glass, Callie L. Fisher Insurance Services, Central Coast Casualty Restoration, Central Coast Propane, Country Florist, Cristal Air & Emergency Service, DaCosse and Associates, Deep Steam Carpet Cleaning, Edward Jones – Financial Advisor Matt Oppedahl, Five Star Rain Gutters, Frontier Floors & Window Coverings, Hamon Overhead Door Company, Hansen Enterprises, Harrington Home Furniture Outlet, HFG Coastal Insurance Services, Lisa Lu Davis, DMD, Realtor Nicolette Harley, North County Carpet and Upholstery Cleaners, North County Plumbing and Drain Cleaning, Paradise Limousine Co., Paso Robles Heating and Air, Paso Robles Safe & Lock, Pure Elements Salon, Rick Goree – State Farm Insurance Agent, Romo Septic Service, Rossi Law, Spinnaker Financial, Steve Allen – Connect Home Loans, Steve Schmidt Topsoil, Steve Weber – State Farm Insurance Agent, Stifel, Templeton Glass, The Gifted Basket, The Mobile Oil Changers, The Tree Man, Uncorked Wine Tours, We Help You Legal, and Wildhorse Propane & Appliance. “Thank you to all of our advertiser and our dedicate staff for making the book as success,” Brennan said. Access Publishing’s staff includes Beth Brennan, Karli Twisselman, Sarah Bolyard, DuPree Dial, Nona Cantalupo, Karen Battaglia, Sally Giordano, Noah Cryns, Meagan Friberg and Jeannie Aisner. The first edition of North County Access was published in November of 1993 by Keith and Sheena Berwick. They operated the Country News which was later sold and consolidated with the Paso Robles Daily Press and became the Country News Press in 1996 under publisher T. Pat Cavanaugh. By 1998, North County Access was taken over by Casey Printing of King City operated by Richard and Bill Casey. They sold the business in 2006 to Scott and Beth Brennan who now publish the directory under Access Publishing as part of their many advertising and marketing solutions for local businesses. Local newspaper veterans Nona Cantalupo and Karen Battaglia have worked for North County Access for most of it’s 20 year history and continue to this day. Access Publishing provides local business marketing solutions. It’s a leader in online marketing, Internet advertising, local search engine optimization, writing and graphic design and web design. The Paso Robles-based business, owned by Scott and Beth Brennan, has a staff of creative and hardworking employees. The company publishes the county’s leading tourist magazine, The San Luis Obispo County Visitors Guide, North County Access, The Paso Robles Daily News, Your Cambria Phone Book, Templeton Chamber Guide, Heritage Ranch Directory and Oak Shores Directory. Access Publishing is located at 806 9th Street #2D, Paso Robles, CA 93446, (805) 226-9890.